Buy DiGi Prepaid Reload at Carrefour Hypermarket Get FREE RM5 Carrefour Gift Voucher! Good news for DiGi Prepaid customers! 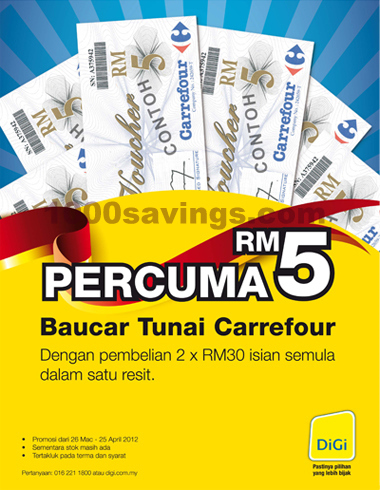 Visit any Carrefour hypermarket near you and purchase two (2) RM30 DiGi Prepaid™ reload in a single receipt and get one (1) RM5 Carrefour gift voucher for FREE*!